Unicorns ~ The Creature that came from Nowhere! The Unicorn (Briabhall) along with the dragon is probably one of Europe’s best known mythical creatures. With the sleek head and body of a white horse, the strong legs of a buck antelope, a lion’s tail, and a single sharp horn on its head it stands as a beautiful, graceful attractive beast, giving it high profile in human imagination. It is an emblem of purity, pure white in colour, strong, fierce and wild in temperament, untameable by nature. And yet also it is meek and gentle towards both its young and with human virgins. It is the symbol of supreme magical power. It teaches that every action is creation, so make every day count. It also helps us to understand the relationship between physical and spiritual realities. Inhabiting the forests and light woodland of Eurasia particularly India, and with a lifespan aprox 40-60 years Unicorns mate once, for life. They are noted for their tender behaviour to each other and especially for being gentle with their young. But they are solitary by nature only coming together during the spring breeding season. Their horns are straight with a spiral groove projecting from the middle of their foreheads. Usually bout 18”/45cm long and variegated, white at the base, black in the middle with a crimson tip.Also seen in all black or light brown. Observed in the 5th century by Greek historian Ctesias was said to have a purple head and dark blue eyes. A splendid black horn almost 3 ft/1m long was observed by early Greek Ambassador to India – Megasthenes. A unicorn’s horn is stronger than any other organic substance known it is a remarkable material not yet fully understood. Invaluable as an antidote to toxins right up to 18th century. Unicorns evolved from stumpy horses of Pliocene era (2 million years ago) developing into the majestic thoroughbreds of today but with greater speed, strength, intelligence and a fearsome brow weapon. If left alone they are a peaceable creature, but in battle they are strong and ferocious – a necessary trait as they were natural prey for large predators like lions and tigers. The age old conflict between unicorn and lion is a feature of the British Royal Family’s Coat of Arms (shield supplied by the English Lion and the Scottish Unicorn) Also in well known nursery rhyme. The Lion’s victory is a metaphor for the Lion’s evolutionary triumph. The Unicorn’s exceptional speed and strength made it impossible to hunt in the normal way. Unicorns are prone to charging horn first at all adversaries and piercing all armour. Consequently the hunters would stand in front of a tree, stepping aside at the last minute and the unicorn horn would spear the tree leaving it open to attack. They’re easily mesmerised by their own reflection eg in a virgin’s mirror! 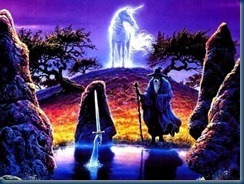 Hunters can catch the unicorn only by placing a young virgin in his haunts. No sooner does he see the damsel, than he runs towards her and lies down at her feet and so suffers himself to be captured. 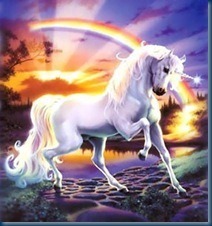 The hunter would then kill the unicorn or chop off its horn leavin g the unicorn vulnerable to all kinds of predators. 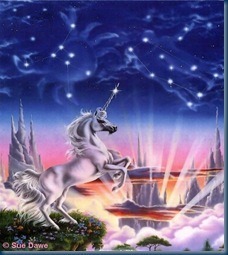 Virgins were largely responsible for the destruction of the European Unicorn population. The practice was ended in 17th century when virgins suddenly became extremely rare! Hunting pretty much ceased in the absence of horn demand, which initially dropped off between 1563 and 1638 when it was banned in churches and hailed valueless by those who claimed, they were instead “Narwhal” tusks. But Unicorns had already been hunted close to extinction for the horns that made them unique. In Europe populations WERE extinct. The few remainder continued to live a lonely life in North India, Central Asia and the Caucasu, untamed and unbowed. Legend says they disappeared when Noah forgot to take any on board the arc. However there is evidence enough of their survival into the modern age before they became extinct. Unicorns are unique because they are not in mythology. There are no mythical tales about Unicorns unlike Pegasus – the winged horse. For a creature that came from nowhere, never really existed and has no real origins the Unicorn stayed alive in the imagination of the human race fo r a remarkable length of time. No other creature paralleled it apart, possibly from the Griffon, and that not to the same degree. Greek scholars believed it to be real and to have come from India. 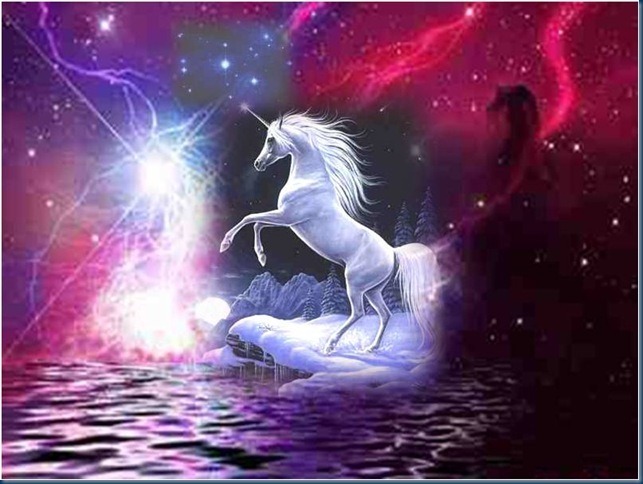 At that time little was known of India either, so both seemed magical and mythical, and the mystical, mysterious Unicorn was a creature who commanded great respect and power. This was perhaps also because the Unicorn is the only mythical creature not based on human fears. They were not monsters, but were revered and respected. They were strong, solitary creatures who sought to do good for all, and never posed a threat to humans or any other creature that did not first seek to harm them. This is quite facinating my dear Icewolfie. I like that nursery rhyme and I never knew that about the British Royal coat of arms. 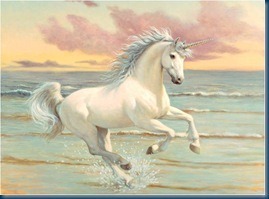 I thougt it was a quite sad that the virgins may have been responsible for the destruction of the European Unicorn. Oh dear… it has been said that virgins may be on the rise again…LOL I hope this won’t hurt the make us non-believers of those magnificent creatures. Revive the Unicorns, I say! 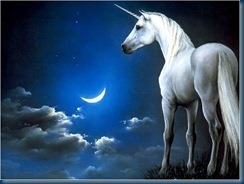 I enjoy this one very much Wolfie, great graphics and I have learned some new things about Unicorns. I was subscribed to you right from the start, but due to the Read my Subscriptions problem and that it was saying there were none to see, I experimented with unsubscribing and resubscribing from peoples blogs to see if that would help…it didn’t! I can’t remember what I added to this posting on my last comment but what I can say is that it is a wonderful rearrangement that offers such a wide variety of thought, the lengths that you have gone to in the representation of this piece is most excellent giving the reader a wealth of interesting information. It is a genuine treat for all that read it with its in depth mythological symbolism and the uniqueness of the theme offers a greater knowledge. Thanks for stopping by for a second time O Dedicated One!!! LoL 😉 Wouldn’t be the same without them! Think I went a little detail mad on this one Alice! But yes, they are a very beautiful creature and I would like to believe they are real! HoooOOOOoWWWWLLLiiinnnnnnnnnnnnG Wolfie Greetings! I too love horses, the recent Royal Windsor Horse Show treated me to awesome examples of the equine breeds, their power and grace. There is something very dreamlike about the freedom and sheer joy of living that being astride one of these noble creatures brings, the wind rushing around you, the flying mane, and the smooth sliding of muscles as they gallop into forever….Magic!! Yes, Horses hold particular memories for me.. both in this life and in another.. My earliest memory was 5.. I knew I had rode horse before I was born… and was obsessed with them.. At the age of 5 I asked my Dad could we have one.. He said and where would we keep it.. I said Daddy we have a BIG lawn… I often remember him telling my own children that story much to my embarrassment Years later lol I think I must have nagged and nagged at him so I could have riding lessons..
Good to see you safely back in my Icy Realm 🙂 Looking cool so there must have been plenty of tasty bites to keep you going in Whitby! Hmm…yes 😉 Seeing a virgin is definately becoming a rare and almost extinct occasion…! The Vampire soap box…lol…be very careful with that pls, these soap boxes can be very slippery when trodden on and all kinds of wicked accidents can occur especially when capes and washing lines feature in the scenario…. 😉 Think banana skins…lol…and perhaps you should stop thinking “hunt virgins!! !” and as to that other bit…breaking them in gently…lol how very cheeky! 🙂 Vampires and Unicorns have more in common than I’d have thought it would seem! No sign of Icewolfie polishing???!! No sign!!!!! Icewolfie has been ernestly polishing rat traps to gleaming shiney perfection in the hope that the resident rats will be drawn by their alluring beauty and become entrapped in them! Unfortunately Icewolfie is still waiting 😉 … fancy a midnight snack? lol they will test your agility and flying skills to the limit! Or you could always scewer them on a Unicorn’s horn if you like 🙂 Think how infinitely grateful and indebted Icewolfie will be to you… and it’s always wickedly awesome to see the Master Vampire of the Gothic Realm himself stroll through the mythological mysteries of the icewolfie Icy Realm! I could have sworn I put up a comment on this delightful post Wolfie, but sorry I obviously didn’t. However, such an interesting lot of facts here. I’ve never had a horse, I’m a bit wary of them. But my friend Sue used to ride and teach, just as well she’s used to them as when we go out in the New Forest, as to-day, I would have been a quivering wreck when they came up to nose at our picnic [carton of juice actually] but Stroodle is very brave and barks loudly to chase them away.